The North hero House is a classic Vermont Bed & Breakfast Country Inn featuring comfortable and gracious rooms, many with spectacular views of Lake Champlain and the Green Mountains of Vermont. The North Hero House is comprised of four historic buildings. 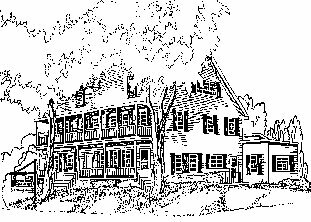 The Main Inn offers nine beautiful guest rooms, the dining rooms, tavern, library, and sitting rooms. Built in 1891, it has recently completed a total renovation. The Cove House, Homestead, and Southwind also renovated and are situated directly on the Lakeshore. These cottage rooms offer a variety of configurations of size and bedding. Whether you're longng for that romantic getaway or simply wish to enjoy summer on Lake Champlain with your family, you will find our guest rooms to be perfect. Begin your day with a cup of fresh-brewed coffee and a glorious Green Mountain sunrise from your balcony porch. Then enjoy breakfast in the bright setting of our greenhouse breakfast room amidst colorful and fragrant plants and blossoms. 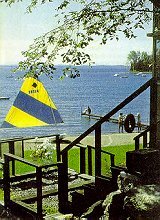 Our Lakeshore provides a beach for sunning and swimming, boats for sailing or rowing, abundant sportfishing and comfy adirondack chairs for simply relaxing We also have a tennis court for those who wish to earn their swim the hard way. Many of our rooms and suites have jacuzzi baths which will truly help you relax and prepare for the evening. After a day of enjoying the surroundings you will look forward to a most enjoyable dinner carefully prepared by our staff and served in our intimate candle-lit dining rooms. This year, treat your loved one to a special getaway. The North Hero House--the essence of Vermont Hospitality.